Congratulations students for completing all of the snow make up days with eLearning. The district is now back on schedule. Reminder that our ELearning Window is open through Tuesday at 8 am! Refer to our website Libertyperry.org for more information! SES Chocolate Bunny Fundraiser pickup is from 12-5 today. Enter through the Main Office door. Items can also be picked up Friday during the school day. 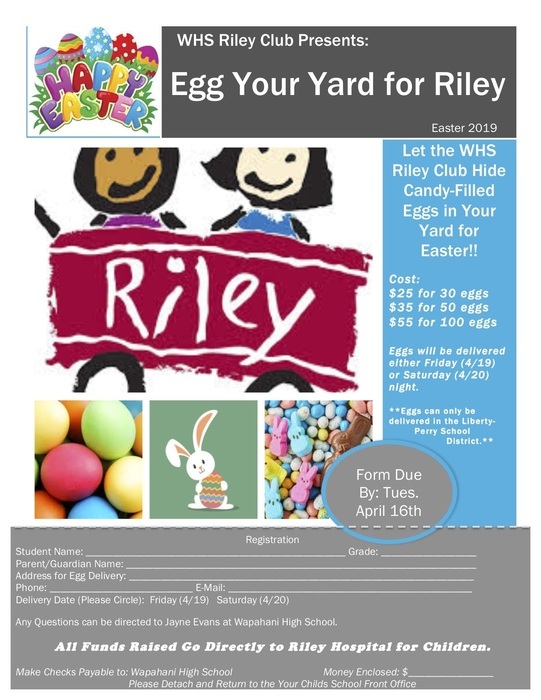 Egg Your Yard Fundraiser presented by the Riley Club at WHS. Check out the flyer attached! Also watch for information to come regarding the Dance Marathon featuring the Touch-a-Truck event on April 27th @ WHS! SES April 2019 Newsletter for Families. It can also be found on the website under Documents - SES - Newsletters. Please note the corrected date for the Easter Egg Hunt - April 17. 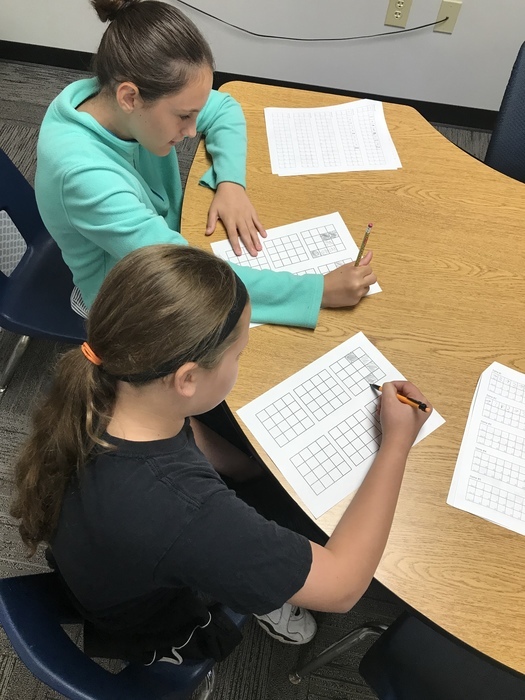 SES April 2019 Newsletter for Families. It can also be found on the website under Documents - SES - Newsletters. Only 8 weeks of school left this school year. Make each day count! Finish strong! https://stores.inksoft.com/WS15463/shop/home Just over two days left to order your new Wapahani Baseball gear! The online store closes this Tuesday, April 2 at 12:59 P.M. The Selma Braves Track & Field apparel online store is now open: https://selmabravestrack.itemorder.com/sale The store will be open until Thursday, April 4. 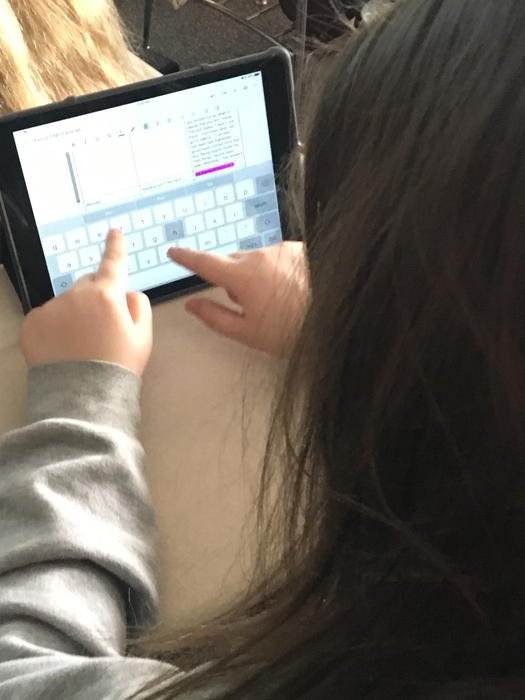 All 3rd grade students at SES will be taking the IREAD assessments on March 19 & 20. Good luck 3rd graders! Try your best and show us all that you know! Congratulations to Mr. Van Note and the SMS Choir and Bands in their performance last night! Great job by all even though several were out with or battling illness! Don't forget the eLearning window opens Thursday evening to make up snow day number 5 this school year. After this window we only have 1 more before we are caught up. 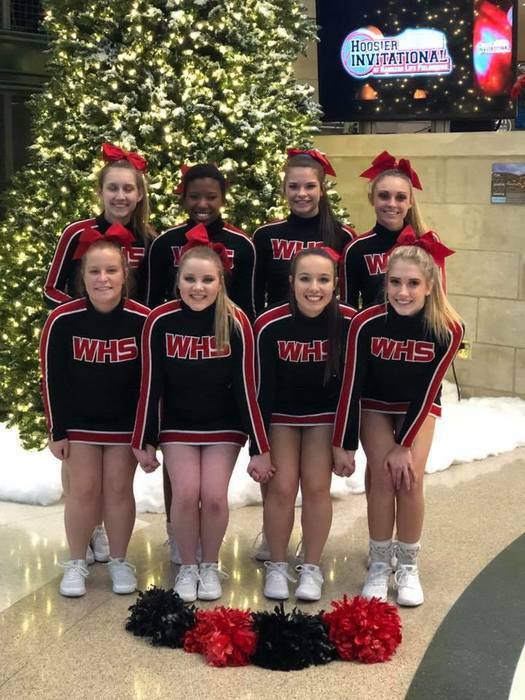 Good Luck to the WHS Cheer Team tonight as they compete in the MEC Cheer Competition at Daleville HS. Doors open at 5:15pm with 1st competition starting at 6pm. Thank you Girls and Coach Clayton for your hard work and school spirit! Go Fight Win Raiders! SES Chocolate Bunny sale starts today through March 19. Proceeds benefit Student Activities. The next eLearning window will be from March 14, 2019 through March 19, 2019. Congrats to the Raider JV Basketball Team as they finished their 2018-2019 with an outstanding win vs Shenandoah. The Raider JV completed their season with a 17-4 overall record. Great Job Coach Willis and his Raider JV Team. 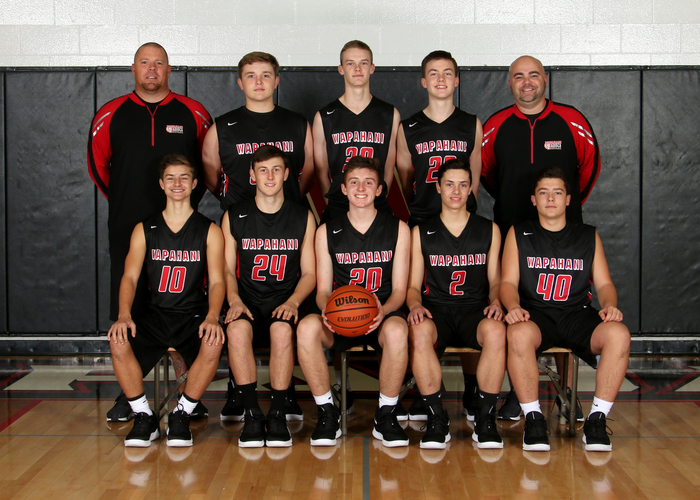 Good Luck to the 2018-2019 Wapahani Boys Basketball Team as they travel to Elwood tonight to take on the host Panthers in IHSAA Sectional 40 action. The Raiders (15-6 overall) will face Elwood with a chance to rematch vs the Lapel Bulldogs on Friday 7:30pm. Go Raider Hoops. An "Inflation Celebration" sponsored by SMS Student Council will take place next Friday, March 1st after school. Cost is $7.00 and will include admission, food, snacks, drink. There is a parent waiver that should be signed and turned in by next Thursday to participate in some events. Congratulations to Paul Fisher and David "Tank" Smith in winning their weight class in the Delaware County Junior HIgh Wrestling Meet last night at Yorktown! The parent meeting for the 8th grade Washington DC trip is tonite at WHS auditorium. A reminder that the end of the grading period is on March 8th (only about 2 weeks away!). Students are encouraged to finish the grading period on a HIGH note! 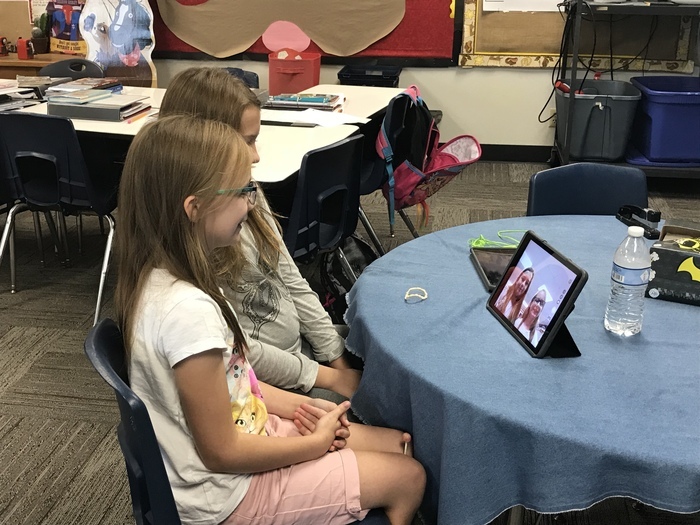 A reminder that the next "ELearning" window opens up today @3:00 and will run until next Wednesday @ 8:00 a.m.
All SES students will participate in Jump Rope for Heart tomorrow, 2/21/19. Wear gym shoes and clothes for P.E. class. You can click view the parent resources and answer any eLearning questions you may have by clicking the MENU button above and looking under Parent Resources. 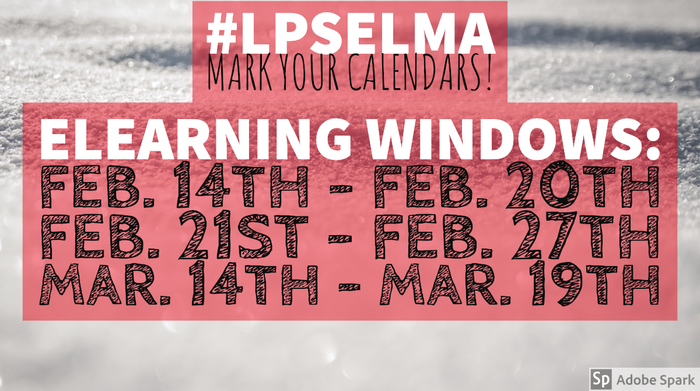 #LPSelma mark you calendars for the next three eLearning Windows! The eLearning Day window is now open! Please make sure to check Canvas between tonight and Tuesday to get your eLearning lessons done at your convenience! 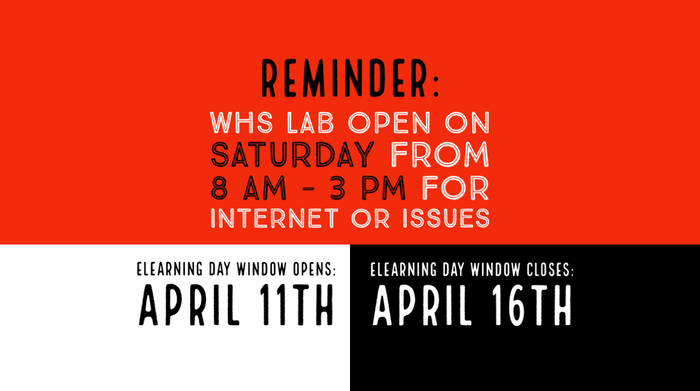 Teachers will be available by email and Canvas on Saturday from 8-3 and the lab will be open at WHS! Mark your calendars - SES Kindergarten Roundup will be April 9, 2019. AM Session is 8:30 - 10:30 for last names A-K; PM Session is 12:00 - 2:00 for last names L-Z. Help us spread the word. Congratulations to the Wapahani Boys Bowling team! State Runners-Up! 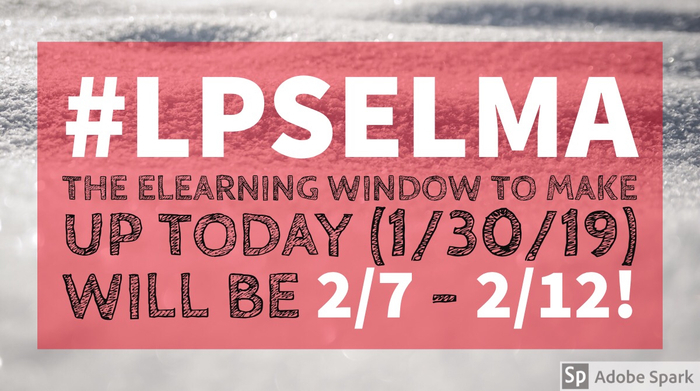 #LPSelma add our next eLearning Day window to your calendar! The best place to get school closing/delay information is either on WLBC 104.1 or following LPS_SUPT1991. 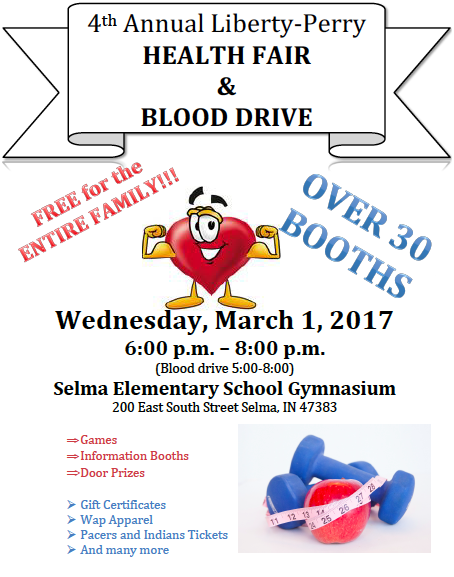 Selma Middle School sports update for the rest of this week. 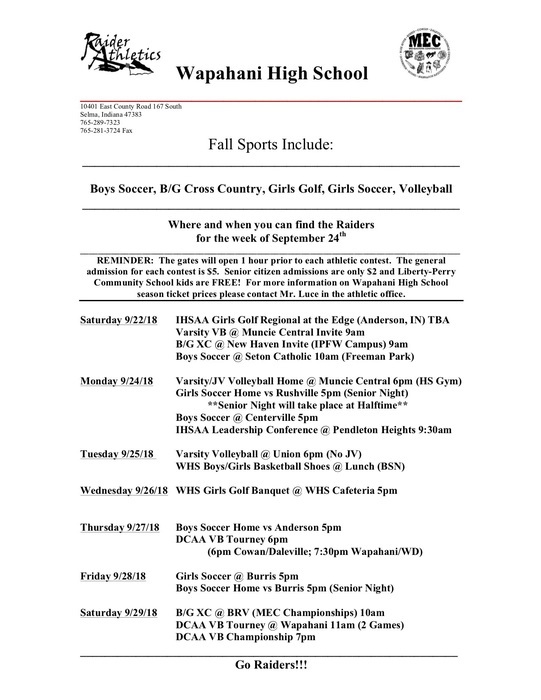 Busy week for athletics! Good luck to all of our teams in county tourney action this week! Boys Junior Pro at Selma Elementary has been CANCELED for this Saturday. Boys will practice next week and conclude JP Tourney on Saturday 1/26 and Saturday 2/2. Selma Elementary Girls Jr. Pro for Saturday, Jan. 19 is canceled. Please help spread the word. The MEC Wrestling Championship on Saturday 1/19 has been postponed until Tuesday 1/22 starting at 5:30pm. Weigh-In's will start at 5pm followed by HS Wrestling at 5:30pm. The MEC Meet will be hosted on Tuesday at Shenandoah High School. All Selma Middle School sporting events and athletic practices for Saturday, Jan. 19 have been postponed or canceled. All games scheduled for Saturday, January 19th have been postponed. The 6th grade boys County has been rescheduled for next Thursday, January 24th here at Selma. There is no make up date scheduled for the girls tournaments at East Jay. 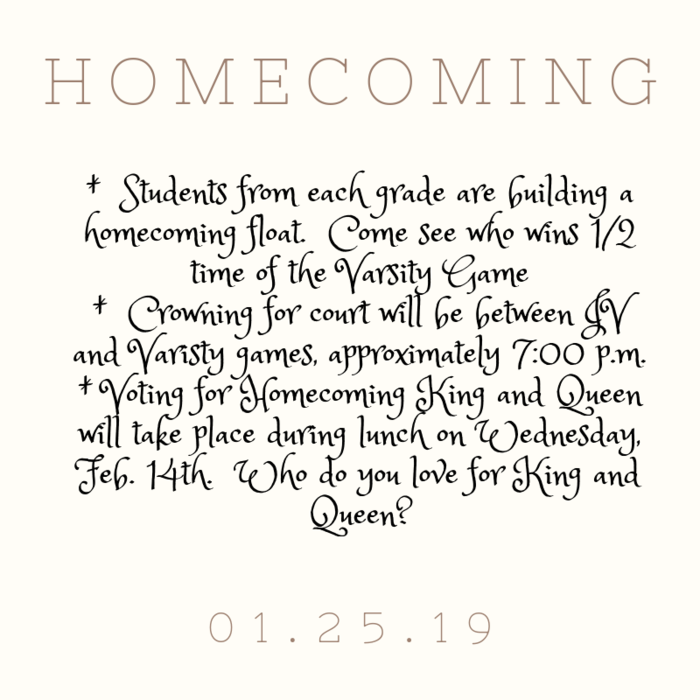 WHS Homecoming 1-25-19! Come and check out all of the fun activities happening at Homecoming this year! Please listen to WLBC for the latest school delay/closing information. Stay warm! Selma Elementary Girls Jr. Pro today (January 12) is going to be canceled because of the snow and the slick roads. Please help spread the word. The 7th & 8th grade girls BB games at Daleville Saturday for MEC Tournament has been postponed to a later date. The 7th grade boys BB game at Blue River Saturday has also been postponed. The 6th grade boys BB team will NOT be traveling to East Jay for the tournament Saturday. The MEC basketball tournaments for tomorrow have been postponed. The 6th grade boys tournament at East Jay has been cancelled as well. 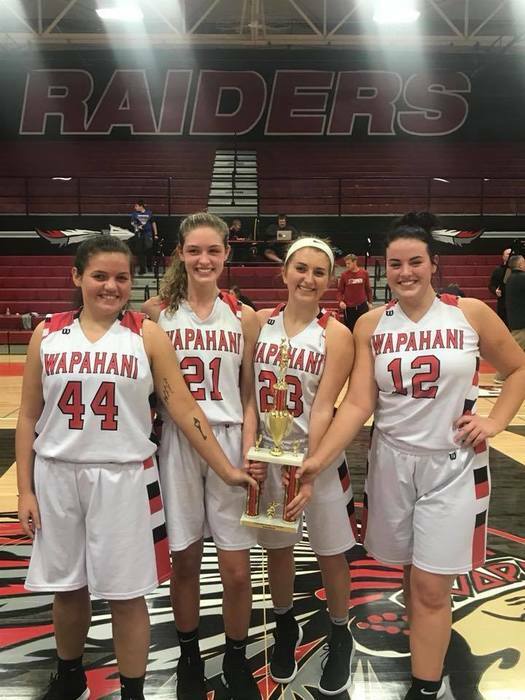 Good Luck to the Wapahani Lady Raiders Basketball Team as they will compete this Saturday Night 6pm in the Delaware County Championship vs Delta at Delta. Good Luck Coach Hudson and the Raiders! SES January Newsletter for Families. It can also be accessed on the website under Menu - Documents - Selma Elementary - Newsletters. Report cards will be sent home with students on Wednesday, January 9th. I am looking forward to everyone coming back to school on January 7, 2019. The faculty and staff at Selma Middle School wish you a happy and safe Christmas Season and a very Happy New Year! 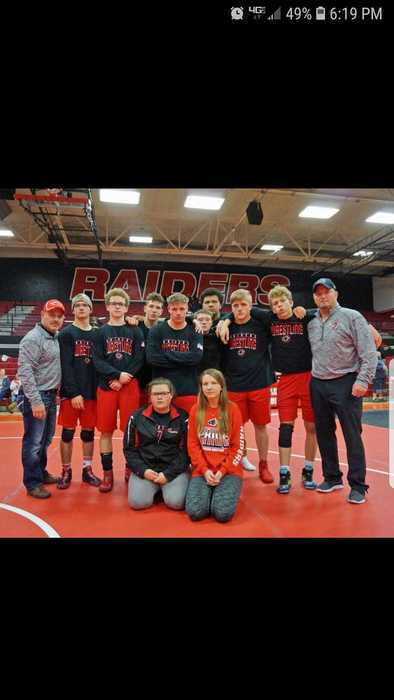 The Wapahani Wrestling Team has been working hard this season and recently hosted the 2018 Raider Rumble. WHS Wrestlers Thad Eiler and Nykiasyn Sweat were named Rumble Champions. Great Job Guys and Coach Delk. Congrats to the WHS Girls JV Team led by Coach Glancy as they enter tonight's game with Winchester with a 10-1 overall record. Great Job Lady Raiders. 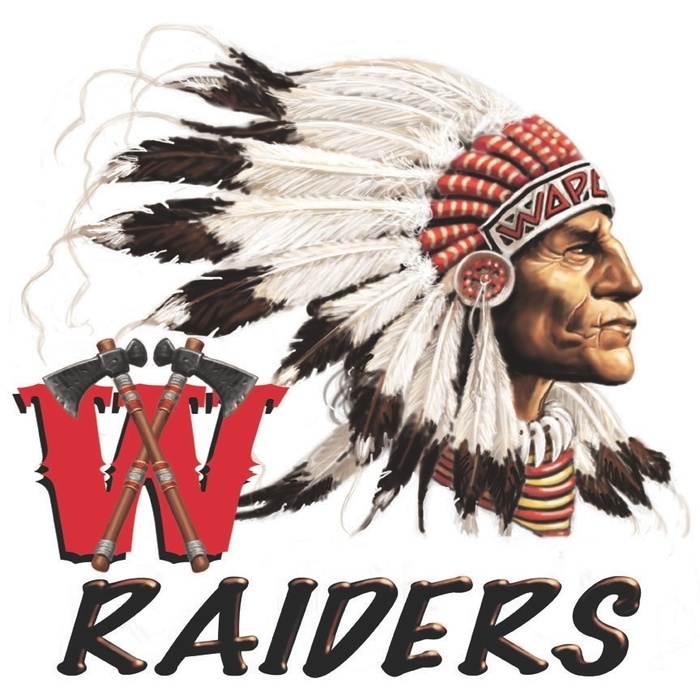 Congratulations to the Wapahani Lady Raiders and Coach Hudson on a terrific start to their 2018-2019 Basketball Season. The Girls are currently 10-2 and will host Winchester tonight 6pm JV Tip. Go Raiders. 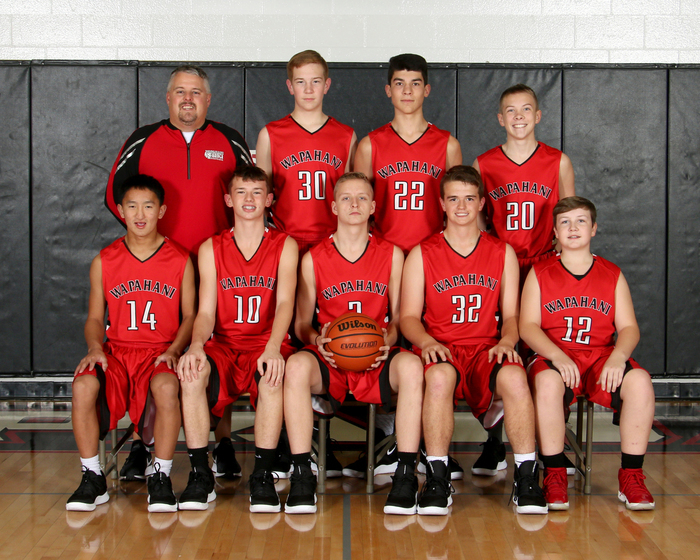 Boys Freshmen Team led by Coach Zickgraf will enter Christmas Break with a 2-4 overall record. The 9th Boys will play Monday January 7th at Frankton 6pm. 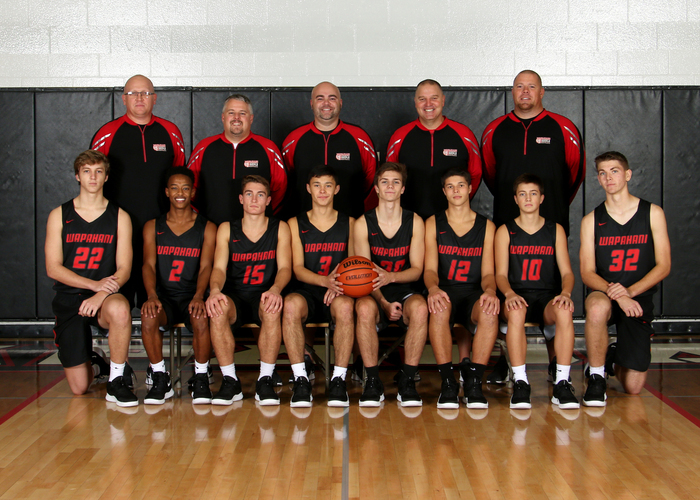 The Wapahani JV Basketball Team currently has a 6-1 Overall Record entering Xmas Break and will play next Saturday at BRV 6pm Tip. Great Job JV Boys! Congratulations to the Wapahani Boys Varsity Basketball Team as they enter Christmas Break with a 6-2 Overall Record. The Boys will play next Saturday 12/29 at Blue River Valley 6pm. 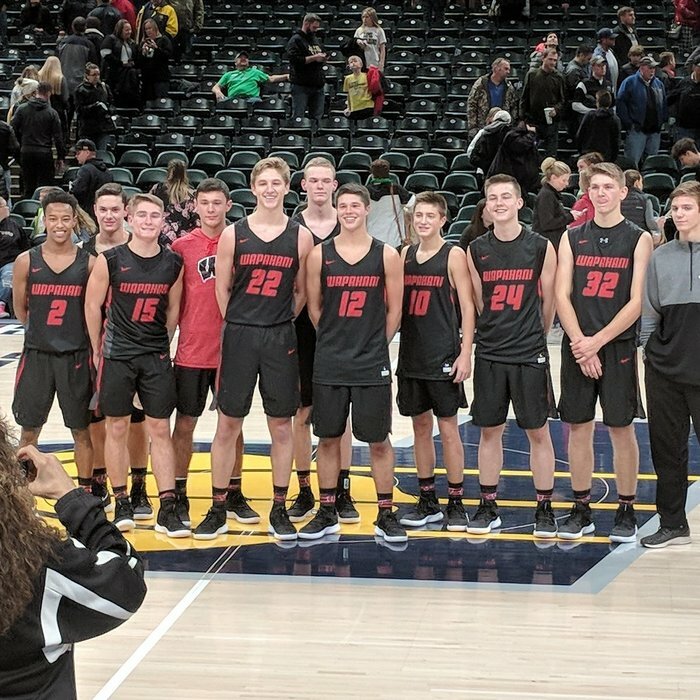 Congratulations to the Wapahani Boys Basketball Team as they defeated Lapel at Bankers Life Fieldhouse on Friday December 7th by a score of 82-74 3OT. It was a great night for the Boys Team, WHS Band, and Cheer Team. Juniors Braxton Davis and Drew Luce were named Co-MVP's. 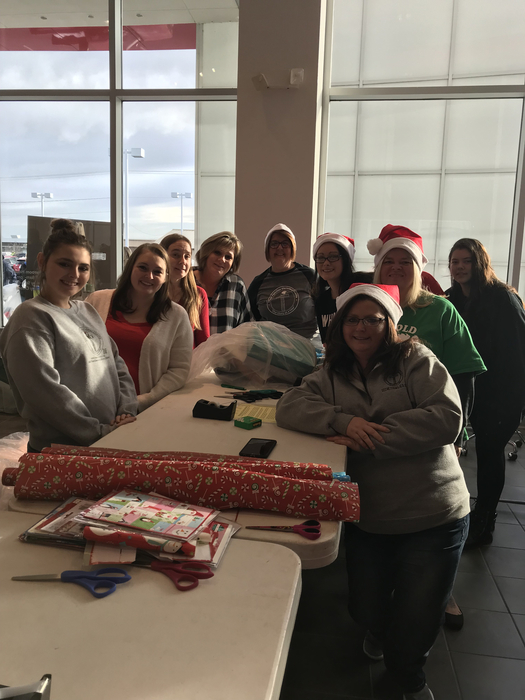 The National Junior Honor Society and Mrs. Brant sponsored "Blankets for Blessings" blanket drive. Students donated 187 blankets that will go out to at least 5 nursing homes in our area! Thanks for your support and participation! 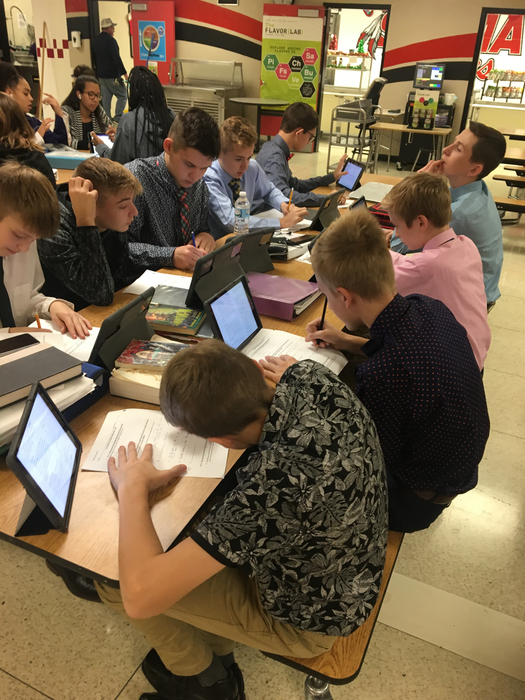 Great job on our first eLearning Day. We had fantastic participation from students. How exciting - way to go! Good luck on finals this week to all of our students! 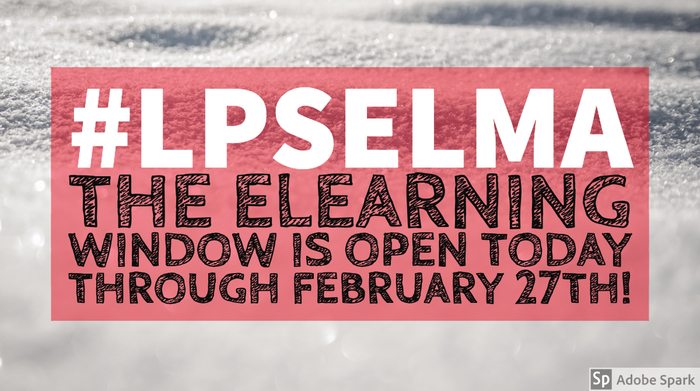 The eLearning Day Window is now open for all LPS students. Students may complete their assignments at any time between now and Tuesday at 8 am. Please refer to our libertyperry.org website for help or answers to questions! Selma Elementary will participate in the United Way's Day of Giving by having a Crazy Christmas Attire Day on Wednesday, December 12th. Bring in $1 and wear your favorite Christmas attire. The proceeds will help the United Way with their programs in Delaware County. SES Car Dismissal changes take effect Monday, 12/3/2018. Information was sent home with students today outlining exact changes. We are excited to implement a safer dismissal process for our car riders. SMS Science Club had a great meeting Thursday! 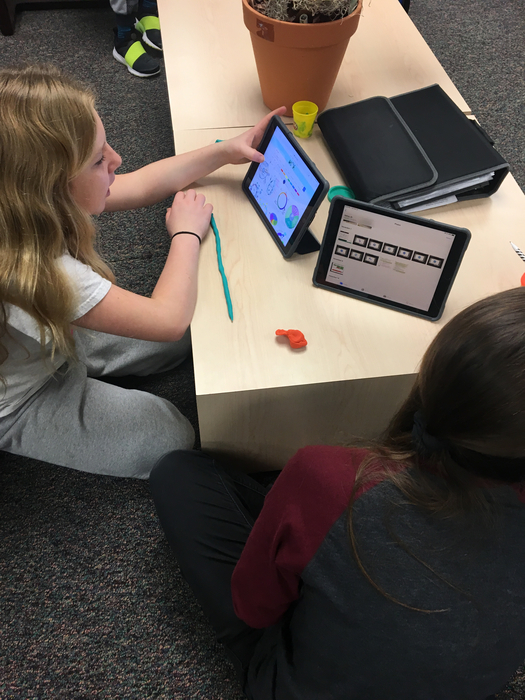 Students made carrot submarines and had a chance to play with the new Sphero Edu SPRK+. 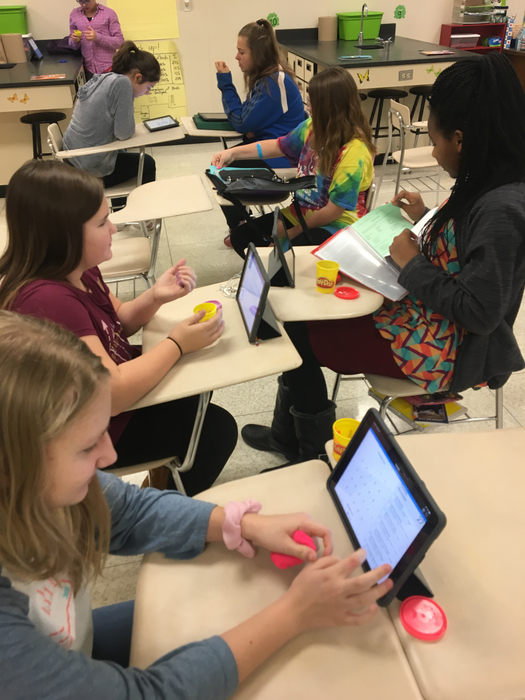 Students at SMS rocked their practice eLearning day today! Great job SES on your practice E-Learning days! Selma Elementary will have a Food Drive November 26-30. The food will be donated to local food banks to help people in our community. Students may wear a hat on Friday if they bring in a food item to donate. Bring in canned or boxed food to help those in need! 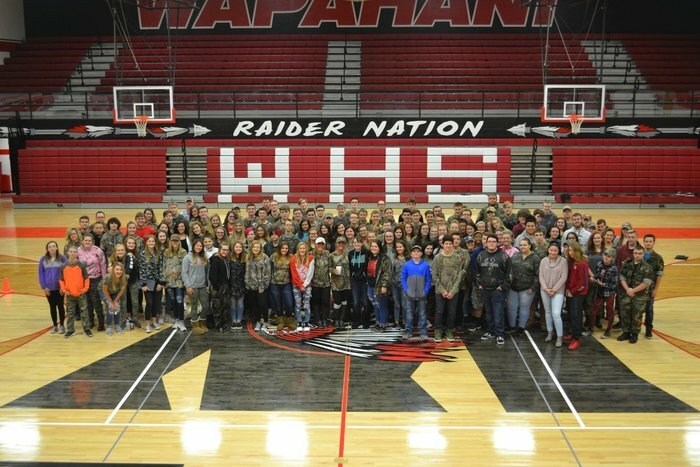 WHS Students and Staff dressed in "Camo" today in remembrance of Sam Al-Samarrie and to show support for his family. 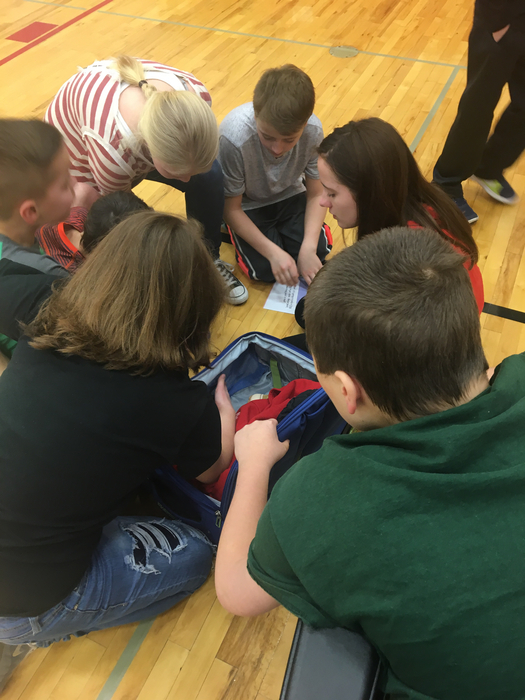 Students raised more than $1,000 to help the family with more activities planned for tonight's Home Boys' Basketball Game. The Raider Boys BB Teams will start their season tonight at Home vs Southwood 6pm. The Night will include performances by our Junior Pro K-1st Grade Teams and SMS Braves 7th Grade.. Also, Good Luck to the WHS Cheer Team as they start their Season. Good Luck Raider Hoops! 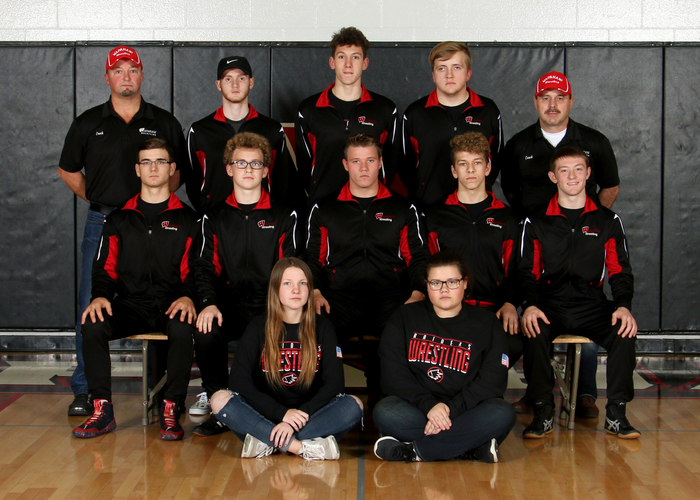 The Wapahani Wrestling Team started their season last Saturday at Daleville. The Boys finished 1-4 as a team but had outstanding days by all 7 boys. Sophomore Nick McElroy finished the day with a 4-0 Record, while Senior Sam Piercy and Freshman Nykiasyn Sweat both finished 3-1. Good Luck Raiders. 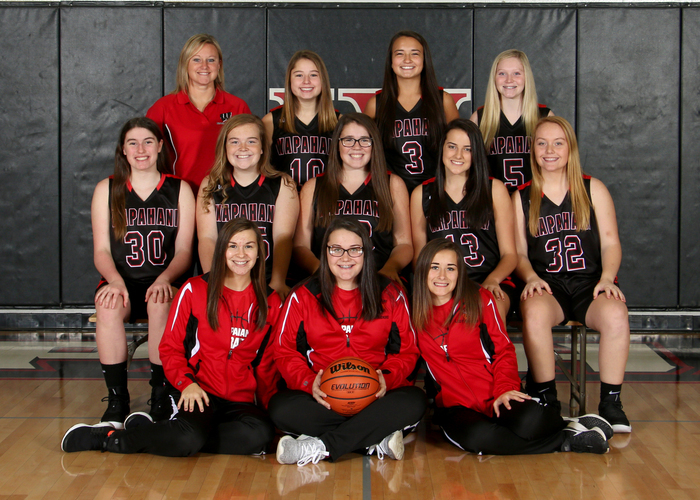 Congratulations to our Wapahani Girls Basketball JV and Varsity Teams as they have both started the season with 4 straight wins! The Girls will host Eastern Hancock in MEC Action this Saturday 12 noon JV Tip. Go Raiders. The Selma Braves online apparel store is now open! Click on the link https://stores.inksoft.com/WS8212/shop/home to order. The store closes this Sunday, Nov. 25 at midnight to ensure Christmas delivery. All orders will ship to SMS and can be picked up in the office. 2/2 Wapahani does have counselors and extra support staff on hand today and will continue to do so as needed. 1/1 We are deeply saddened by the passing of a WHS student. The student's family and friends are in our thoughts and prayers. #LPSelma appreciates the outpouring of support for our students and staff during this difficult time. SES PTO pie fundraiser pickup is today after school until 7:00 p.m.
"Peter Pan", sponsored by WHS/SMS drama and music departments, will be presented on Thursday, November 15th, Friday, November 16th, and Saturday, November 17th. at 7:00 in the high school auditorium. Tickets are $5 and maybe purchased at the WHS office. Progress reports for 2nd grading period go home on Wednesday, Nov. 14th. The 6th grade boys BB tryouts start today after school until 5:00. 6th graders are at SMS and after school all week except Tuesday they go 6:30-8:30. SMS Cheerleading is also starting today with the clinic today and tomorrow 5:45-7:45 and tryouts on Wednesday at the same time. 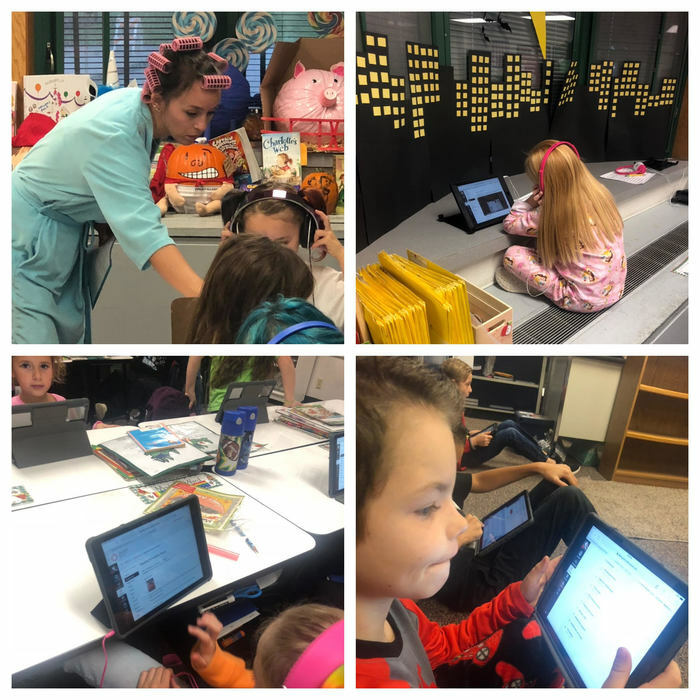 Great job SES teachers, students and staff on your first e-learning practice day! Congrats to the Spell Bowl Team that received a 2nd place finish last night at the regioal meet at Union County! The National Junior Honor Society sponsored "It's the Great Pumpkin, Selma Middle School" this past week at school. Students could donate 25 cents to purchase a small pumpkin that, in turn, created a large one. The 6th graders came out on top with the 7th grade a close second. The SES Cookie Dough fundraiser ends today. All orders and money must be turned in 10/31/2018. Thanks to everyone who participated. Our digital learning practice days have gone well so far. Great job everyone! Congratulations to the new National Honor Society inductees. School will not be in session the week of October 8, 2018. Have a nice fall break! Congratulations to the SMS XC teams last night at the Delaware County Championship meet! The girls placed 4th and were led by county runner-up Lilly Neal. The boys were the county champions and were led by the county champ Nick Cook in a near photo finish! Great job runners! There will be a menu change at SES for Friday, 10/5/2018. New menu: Chicken patty, chicken nuggets or Pork fritter served with AuGratin potatoes, peas, carrots and fruit. This is the last week of the first quarter. Finish strong! Thanks to the Student Council, led by Mrs. Rich and Mrs. Gourley, for their wonderful "Principal Appreciation Video" shown to us today! I appreciate you doing that more than you could know and I am truly blessed to be able to work with such wonderful students, parents, and staff everyday! We had a wonderful convocation today featuring the Ball State Men's Volleyball Team! 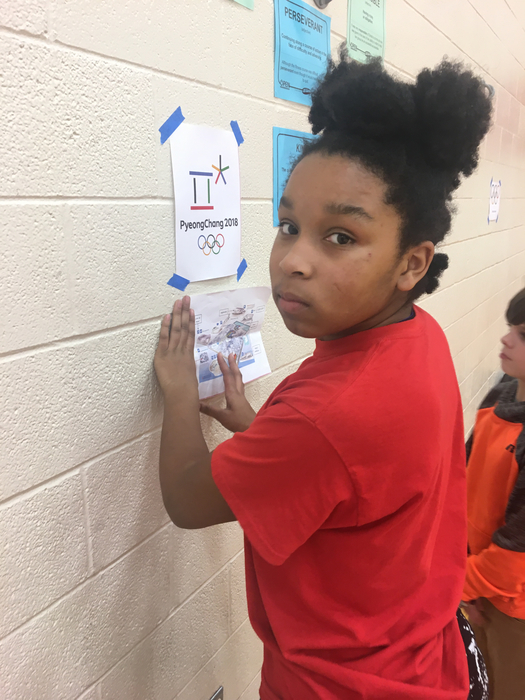 They showed their skill and encouraged students to work hard and have A LOT of interests! Thanks to coach Walton and the BSU Men's Volleyball Team! Good luck to the girls and boys cross country teams in their county meet on Wednesday at Selma at 4:45. 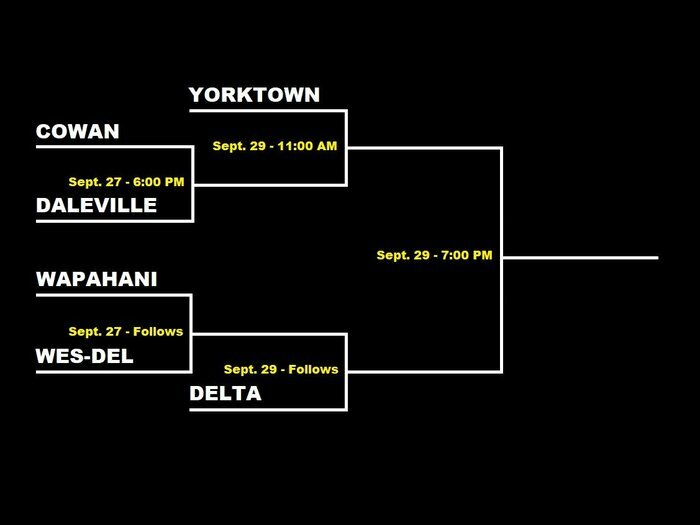 Good luck to the 7th and 8th grade girls volleyball teams as they play in their county tournament on Saturday at Daleville. Play begins Saturday at 9:00. Good luck! Speaking of Delaware County Tournaments, we have had another GREAT fall sports season. Of the many highlights, it is worth noting that the 8th grade volleyball team is trying to "win out" and become one of the very few teams to go ALL 3 YEARS undefeated! Keep it going, girls! 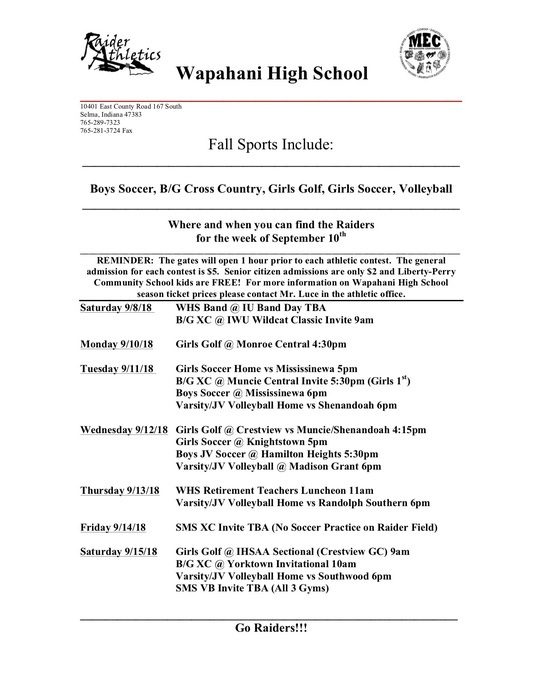 "Spirit Week" this week to jump start the County Tournament for volleyball and cross country! The school is decorated (thanks parents) to fire the teams up and students are participating in "theme" days! There will be a SES Skating Party Tuesday, 10/2/18. 6:30-8:30 at Gibson's. $2 admission, $2.50 skate rental, $.50 locker rental. From Coach Luce... 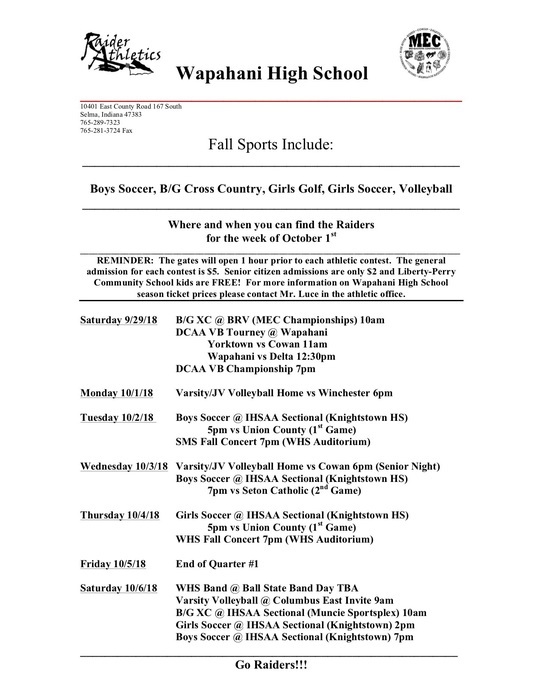 Raider Fans: Good Luck to all of our Wapahani Athletic Teams as they wind down the fall season. Congratulations to all of our Fall Senior Athletes and their Families. Have a great Senior Year! Go Raiders. 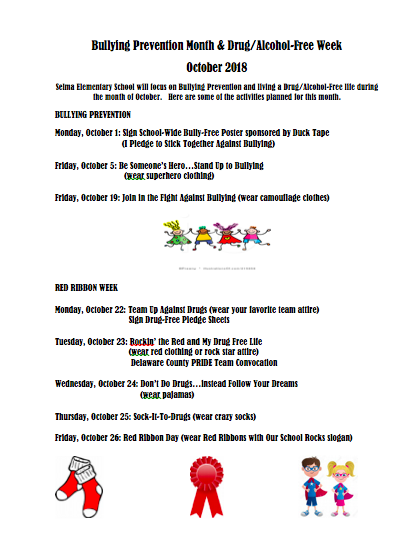 October is Bullying Prevention Month, and October 23-31 is Red Ribbon Week, which promotes living a drug-free life. SES will have different activities and themed days throughout the month to focus on these important topics. The list below shows some of our activities. 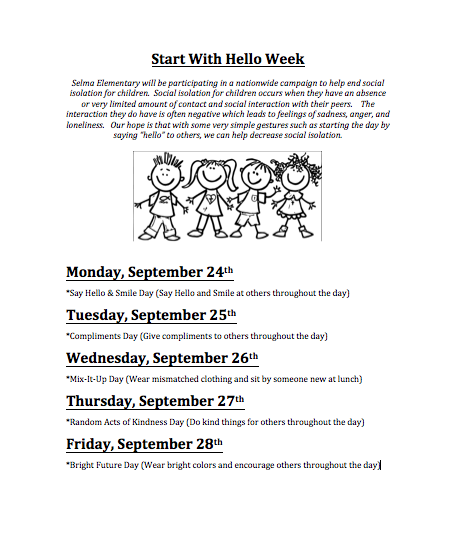 SES is participating in the national campaign "Start With Hello" this week to help decrease social isolation. Student Council members are greeting all students as they enter the building. See below for a list of activities this week. Remember to smile and say hello! A reminder to SMS parents that the Little Caesar's Pizza fundraiser pick up will be on Tuesday, September 25th from 3-5 in the SMS cafeteria. If your student sold more than two items, you will need to make arrangements for fundraiser pick up during the 3-5 time frame. From Mr. Luce... 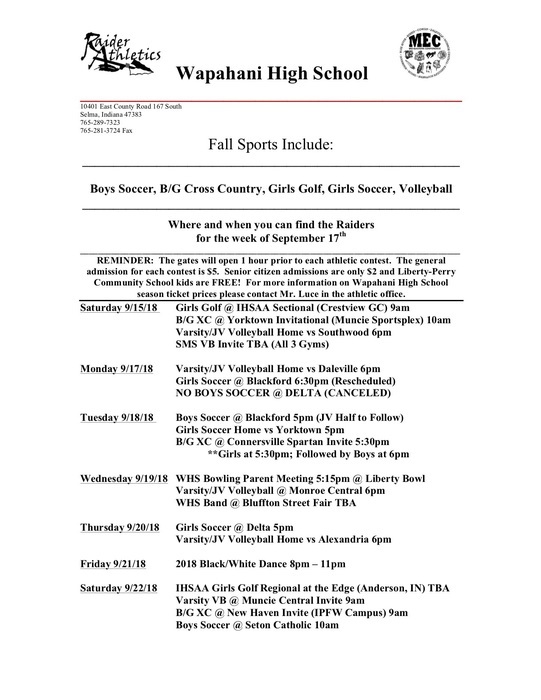 Raider Fans: We are winding down Fall Sports at Wapahani High School and each team is getting ready to play for their respective championships! Go Raiders. A reminder that Picture Retakes will be on October 3rd. SMS "AfterParty" on Friday, September 28th from 3-5! Cost is $5 and includes drink, snack, and bag of color throw! You most likely will get dirty so wear something old! Raider Parents/Fans/Coaches: Good Luck to the Girls Golf Team on Saturday at the IHSAA Girls Golf Sectional. The Lady have had a great year and we wish them the best of luck. Please note - NO BOYS SOCCER MATCH ON MONDAY 9/17 AT DELTA. 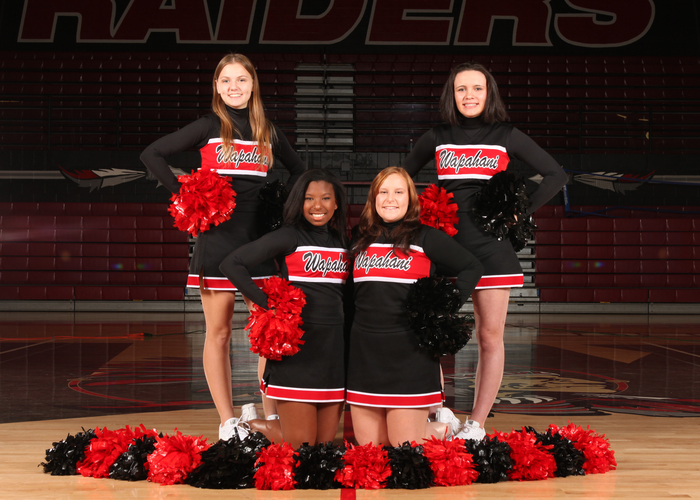 Good Luck Raider Athletics! Don't forget September 17, 2018 is a PD day for SMS and WHS and parent/teacher conferences for SES. The 6th grade class will be taking a field trip to the National Model Aviation Museum on Friday, September 21st. The cost is $8.00 and permission slips should be turned in asap. Contact Mrs. Pasman @ cpasman@libertyperry.org with questions. 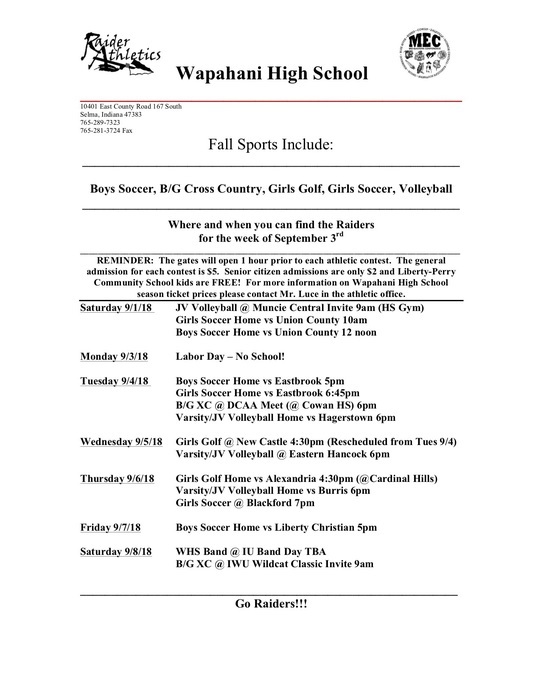 Raider Fans: Please find the attached weekly schedule for the week of September 10th. Go Raiders. 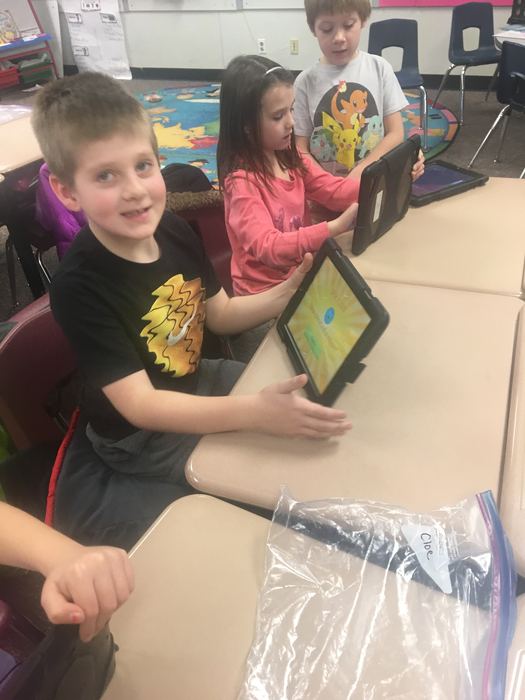 It was another fun filled week in Tech Rotation at SES! 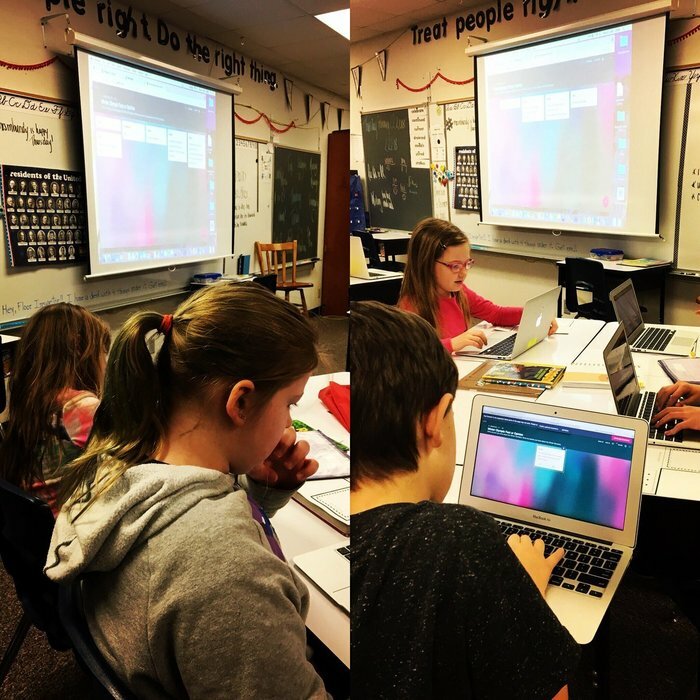 Students were working in Canvas, taking buddy selfies and editing photos, and submitting/attaching photo assignments in Canvas! 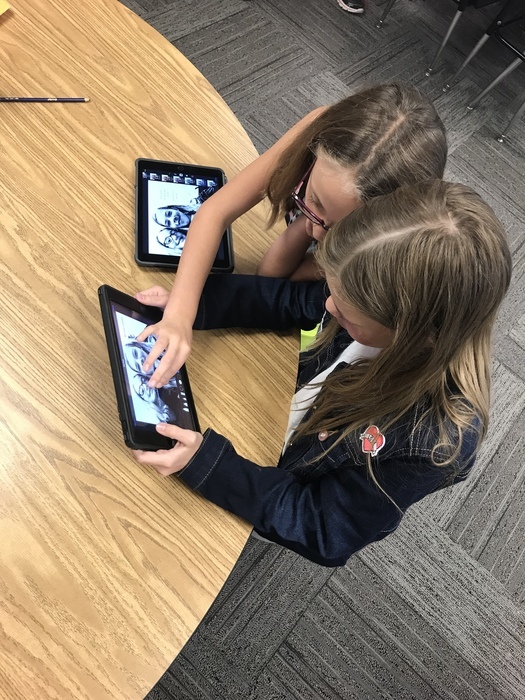 Check out these 4th graders rocking their buddy selfies and photo edits! SES Midterm progress reports will be sent home on Monday, September 10. You can also access grade information in PowerSchool. SES World's Finest Chocolate fundraiser kickoff today. Sales run from September 5 - 18, 2018. A reminder that September 17th will be a PD for secondary students and a parent/teacher conference day for elementary students. NO SCHOOL FOR ANY STUDENTS ON THIS DAY. Progress reports will be sent home with students on Friday, September 7th. 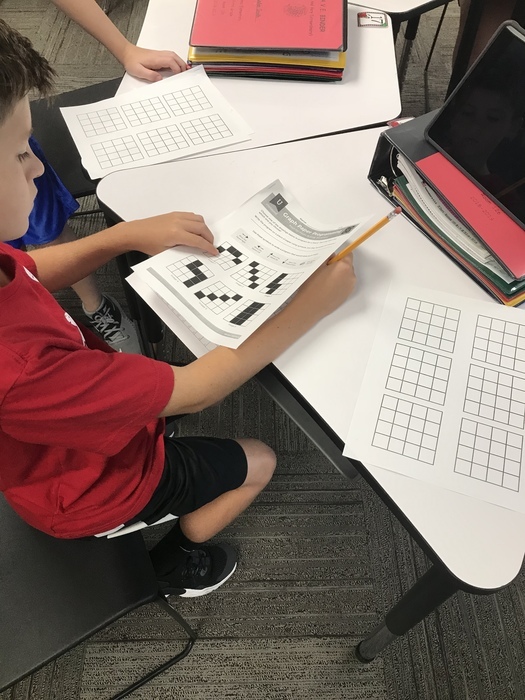 Students have been hard at work during tech rotation this year at SES! 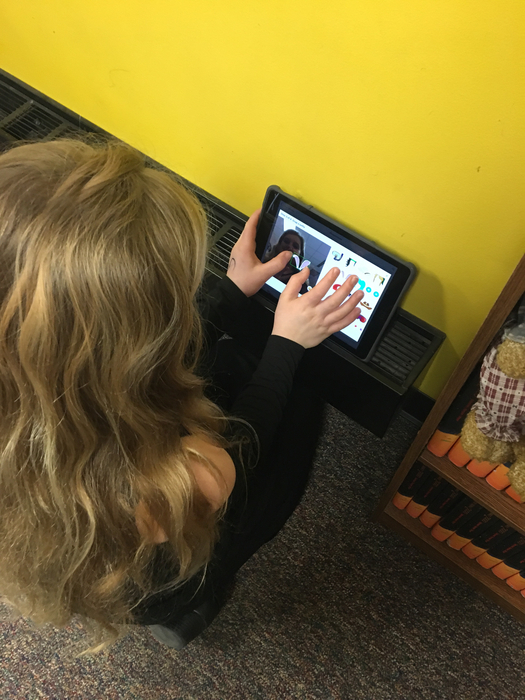 Learning editing tools in camera, Digital Citizenship, coding, and more! It is going to be a fun year with Mrs. Wise! PTO Meeting at SES tonight, 8/29/18 at 6:30 p.m. in the Cafeteria. All are welcome who have an interest in supporting students and staff at SES. Fall sports season opens at SMS tonite with the 6, 7, 8 volleyball teams hosting Yorktown. It has been a very good start to the school year. Thank you to the entire community for putting children first. 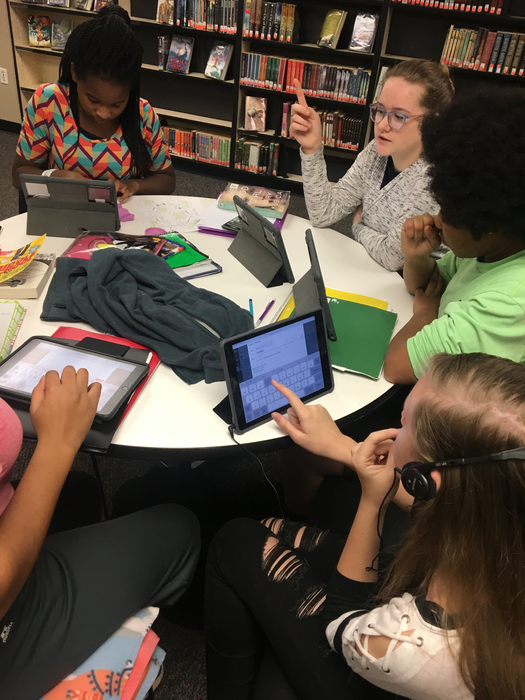 A quick reminder that IPAD insurance and book rent for the 2018-2019 school year are due by August 31st. You can call Teresa @ 288-7242 with questions or to make payment arrangements. Great first day of school! I am looking forward to all of the students returning on Wednesday! Enjoy your last couple of days of summer. We have had a lot of request for transfer applications. You can download your application under Explore LPS and Documents. #LPSelma teachers never stop learning! Having fun while learning about new things @eLead to take into their classrooms this fall! Registration is now open for the 2018-19 school year. Each family should of received a letter with their students report card with directions for registration. Good luck to all of our students taking the ISTEP this week! Welcome kindergarten students! Round-up is always a great day. Have a wonderful spring break #LPSelma! Good luck to the students that are taking the ISTEP this week! 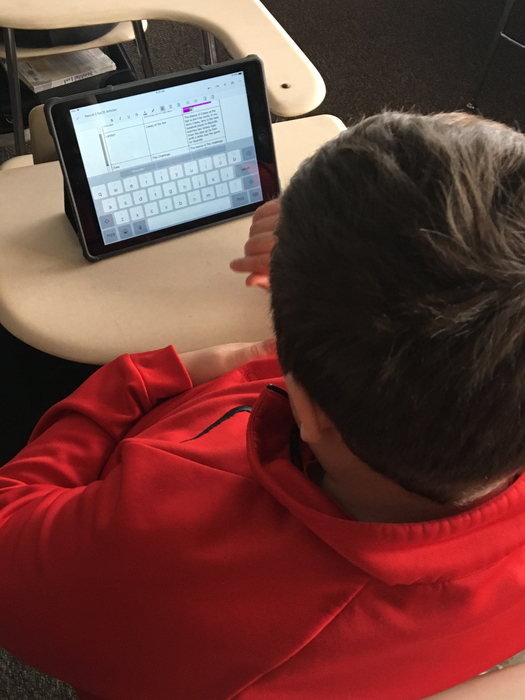 It is National Digital Learning Day and #LPSelma is celebrating! 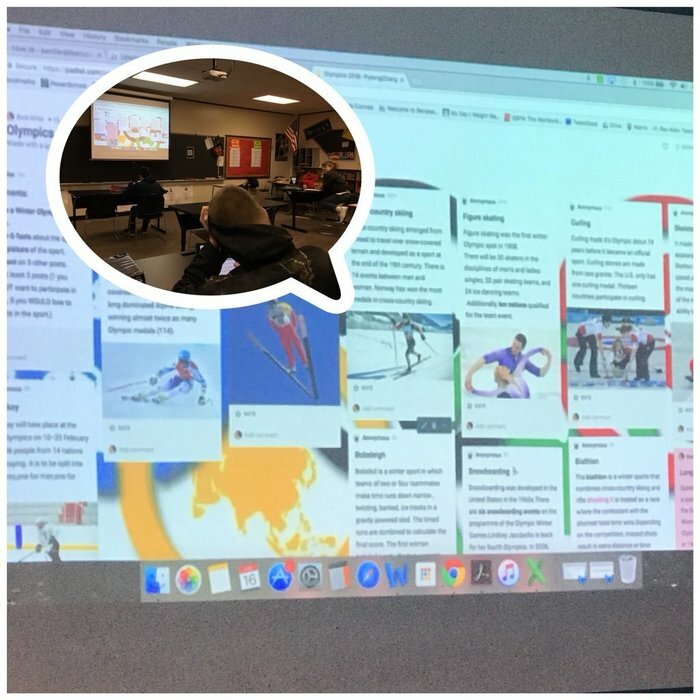 Students are loving new tools teachers are using in their lessons like Flipgrid, Padlet, Socrative and more! 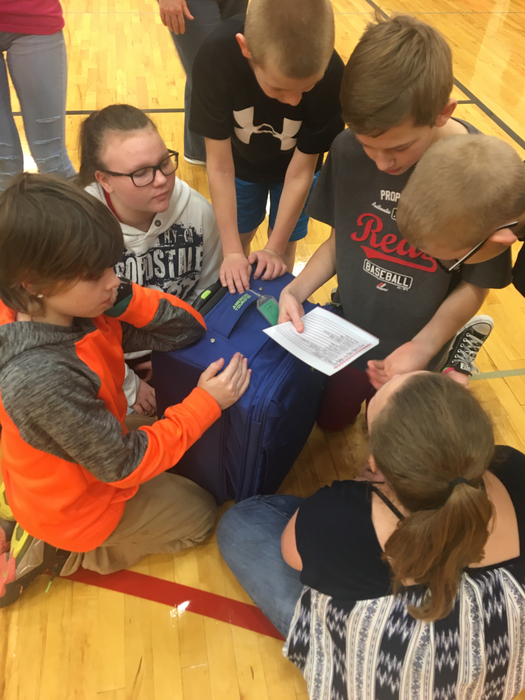 Mrs. Brant's students were attempting to @BreakoutEdu to help get her to the Olympics while working on teamwork! Ask your student if they succeeded! 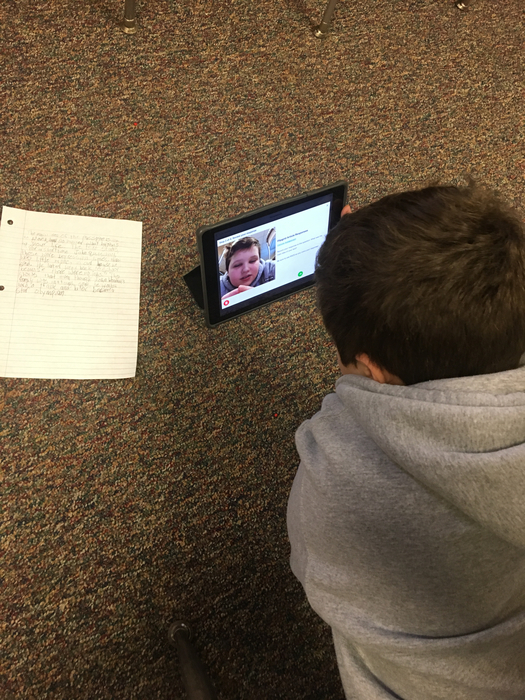 6th graders getting creative with main idea of text and Flipgrid! 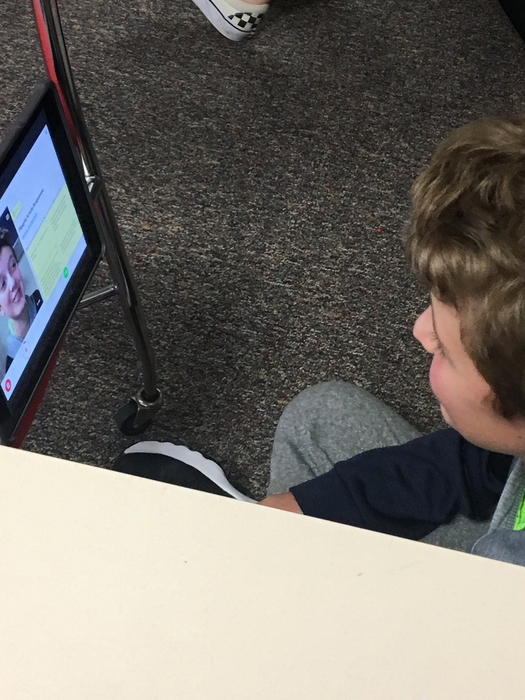 Ask your student to see their Flipgrid response! School will be in session as a snow make up day on February 19, 2018. 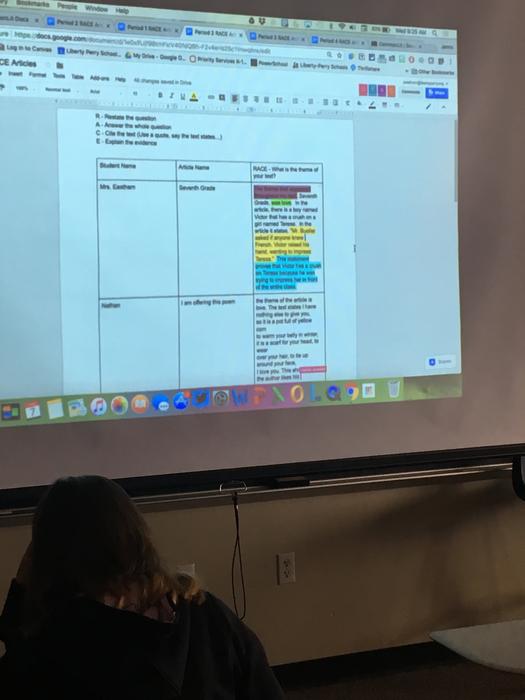 6th graders in Mrs. Milliner's class working on collaborative Google Docs to discuss theme responses of student chosen articles! Congratulations to the Wapahani bowling team on a great season! Finishing in the semi-state is impressive. Kindergarten Round-Up will take place at SES on Thursday, April 12, 2018. Please call SES to register your child. Good luck to the #Wapahani Academic. They begin their season this evening at Monroe Central. Great start to second semester. Keep it up! Enjoy Christmas Break! Students return to school on January 3, 2017. The SAT Program‏Verified account Now that you have your PSAT/NMSQT scores, you can link your @CollegeBoard & @khanacademy accounts to get a personalized #SATPractice plan. 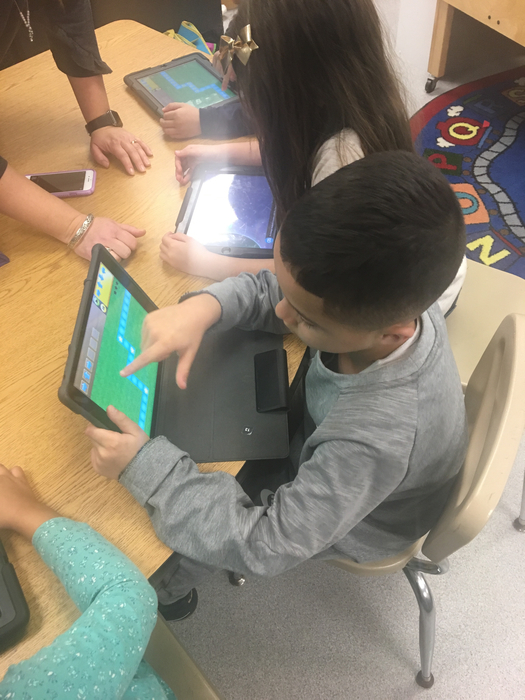 Hour of Code is in full swing this week! 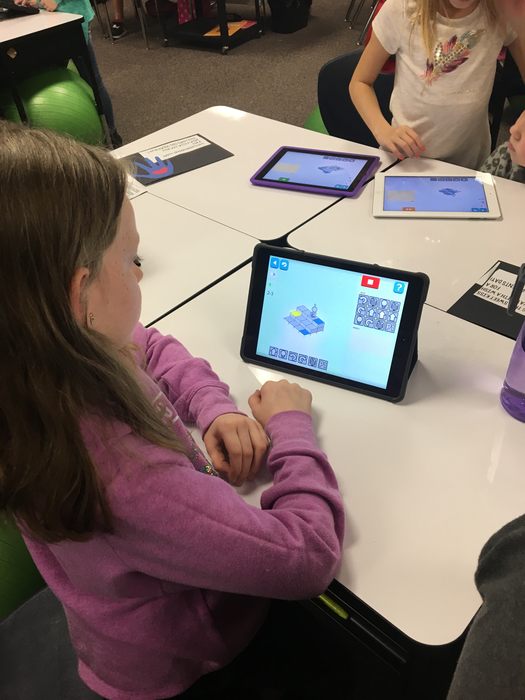 The students at SES have been coding like crazy! Celebrate Literacy with books and reading fun for the whole family Tuesday from 5-8 in the new WHS library. 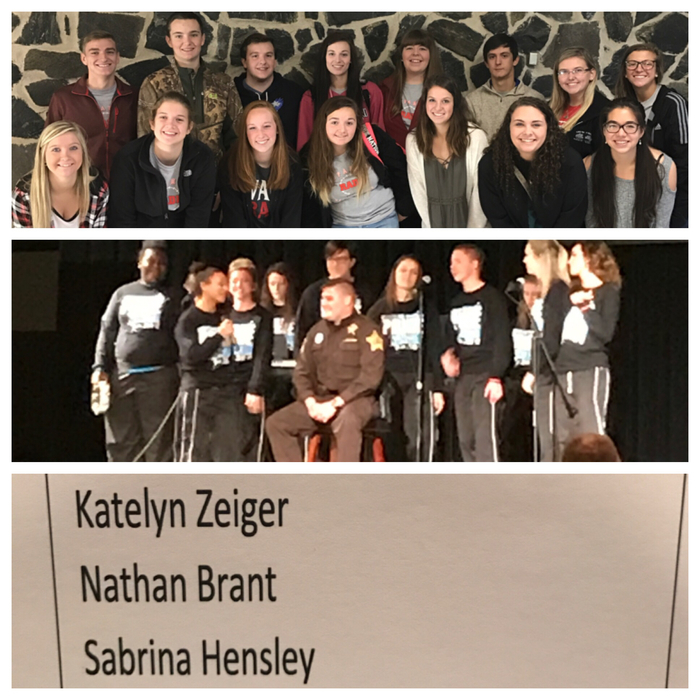 Nice group of students and LPS employees at Secret Families this weekend. 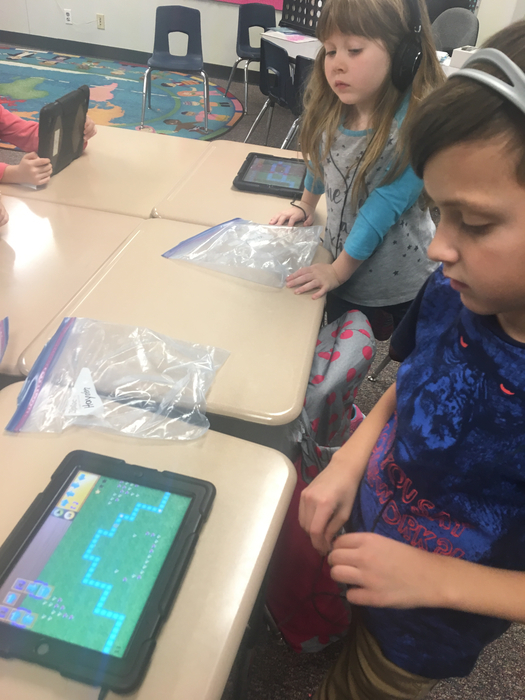 All Liberty-Perry students will be participating in Hour of Code during the week of December 4th. Stay tuned for more updates on this awesome event! The students did a great job in all of the #LPSelma schools holding Veterans Day Programs. Good job! Congratulations to Wapahani High School for being honored at the Indiana Statehouse for the great success the students are having in dual credit courses. FAFSA night is November 6, 2017 from 1:00-7:00 p.m. at Wapahani. Good luck to the Wapahani Vross Country team at Semi-State! Welcome back from fall break! Lets have a great 9 weeks! 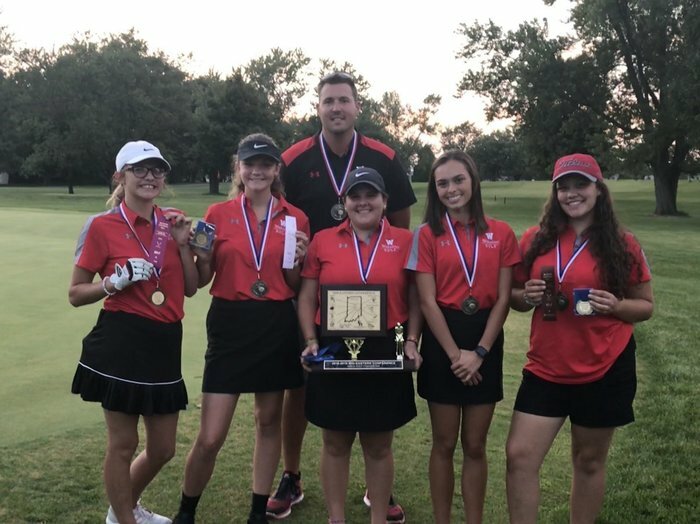 Good luck to the Wapahani girls golf team in the first team regional appearance in the history of the school! This is digital citizenship week! 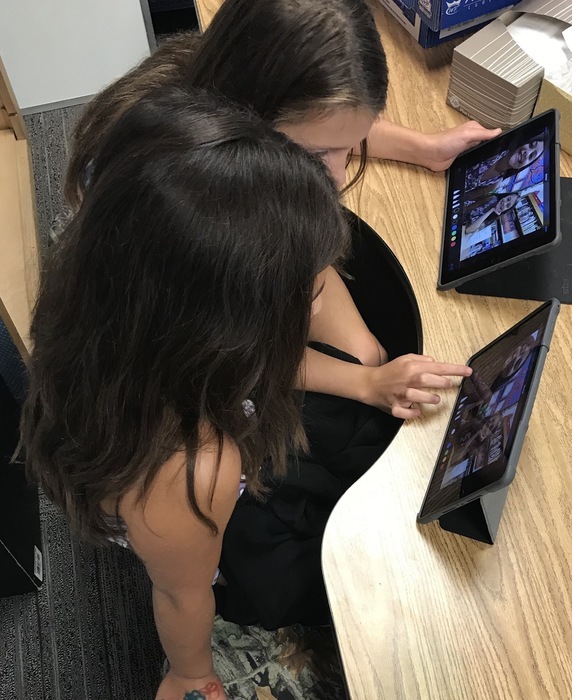 All schools have a lesson each day teaching how to be good digital citizens. Progress Reports will be sent home with each student on Wednesday, September 6, 2017. Congratulations fall athletes. You are off to an amazing start. Great start to the school year. Thank you for trusting our teachers. 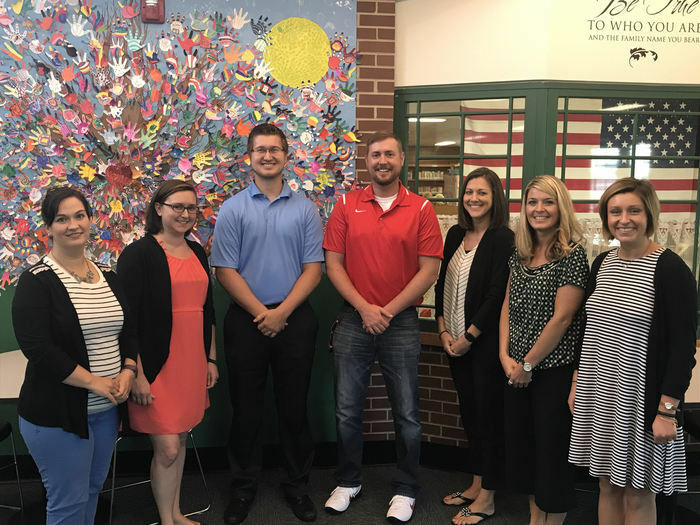 We have several new teachers that will make a positive impact on our district. Welcome (pictured L-R) Mrs. Qualls, Mrs. VanHof, Mr. Sarah, Mr. Mendenhall, Mrs. Mullett, Ms. Jackson and Mrs. Sarah! Registration is on Wednesday July 26th from 8:00-3:00. Thursday July 27th registration is from 12:00-6:00. 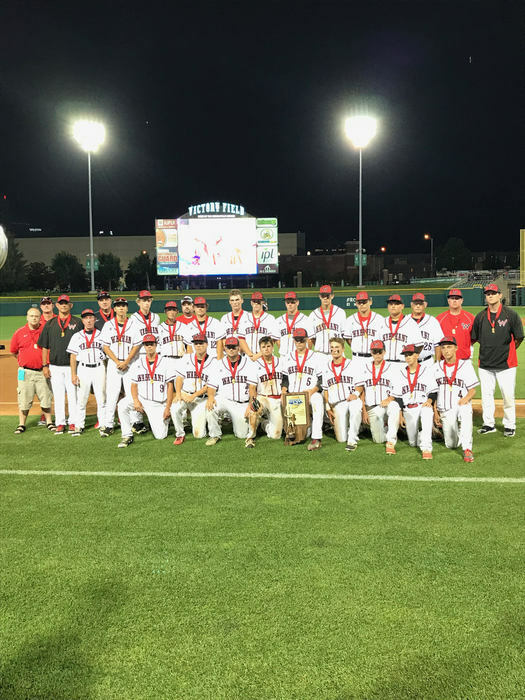 Congratulations Wapahani Baseball on your IHSAA state runner-up season! There are only 2 weeks left in the semester. Finish strong! 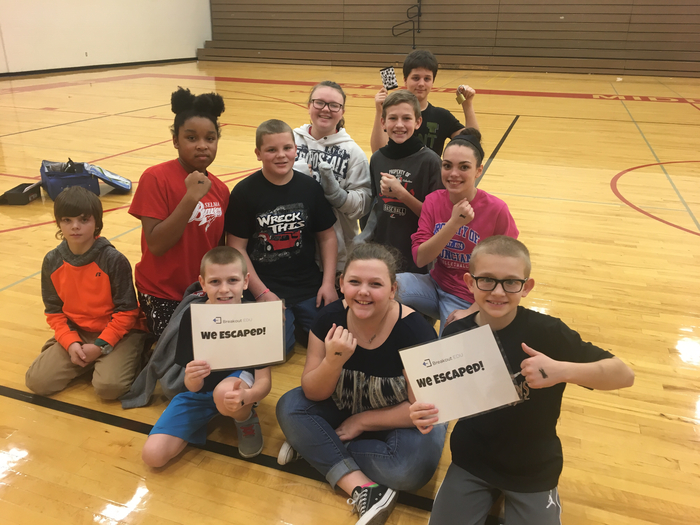 Congratulations to the Wapahani Fine Arts Team! State bound! Good luck! Keep track of your students grades by downloading the Powerschool App. Real time reporting is available. Good luck to all of our athletes as they began the spring season. Good luck to our students that are taking the iRead test today! Good luck #LPSelma students on the ISTEP this week! Reminder - Liberty-Perry Schools will be closed February 20, 2017 for Presidents Day. SELMA ELEMENTARY KINDERGARTEN ROUND-UP! Selma Elementary Kindergarten Round-Up will take place on Tuesday, April 11th, 2017. Call 282-2455 to register your child for Kindergarten Round-Up. Looking forward to the #LPSelma Health Fair! Have a great counselors week Mrs. Moore, Mrs. Bragg and Mrs. Ritchie. 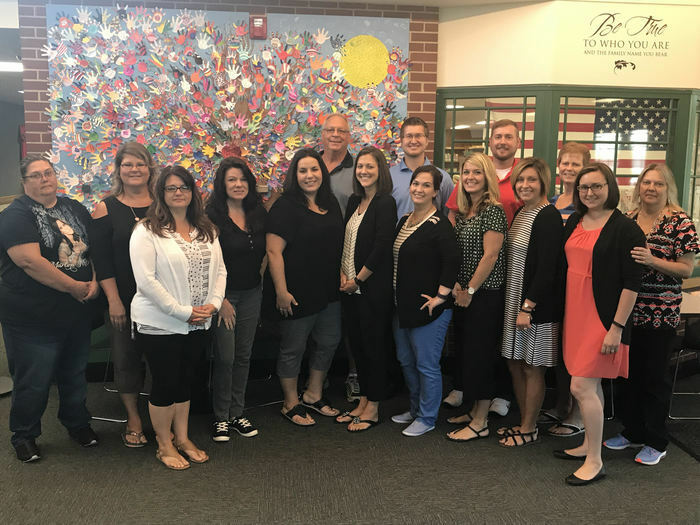 Your work with our students is appreciated! 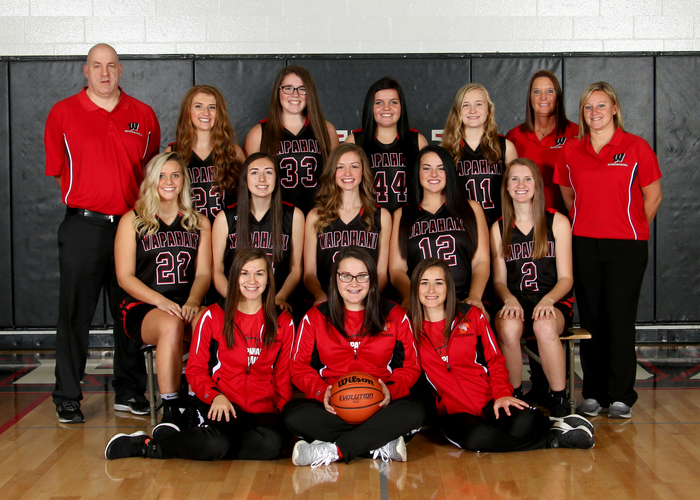 Congratulations to the Wapahani Varsity Girls Basketball Team! Delaware County Champs! Reminder-In celebration of Martin Luther King LPS will not be in session on January 16, 2017. Good luck to our athletic teams participating in the county tournament this week! The best place to hear Liberty-Perry weather related closings and cancellations is WLBC 104.1. #LPSelma is looking forward to a great semester! Students return on January 3, 2017. Have a wonderful Thanksgiving and a great long weekend. Excellent job cast and crew of the musical. We have several excellent performers! Fun to see these 3 show why they are drug free at SES this morning. Had a great time this morning at the Red Ribbon Breakfast. 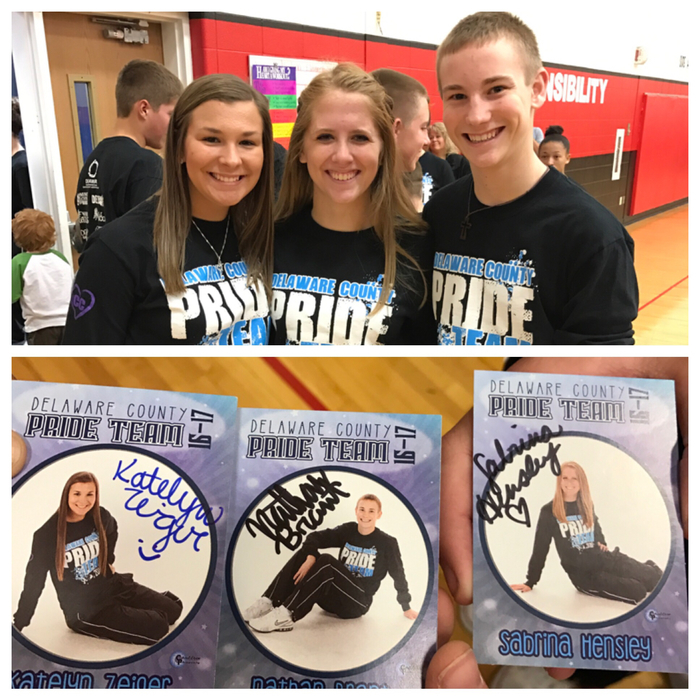 Great job Katelyn, Nathan and Sabrina! Report cards go home on October 19, 2016 for all Liberty-Perry Schools. Don't forget Monday, September 19, 2016 we have parent/teacher conferences and no school for students. 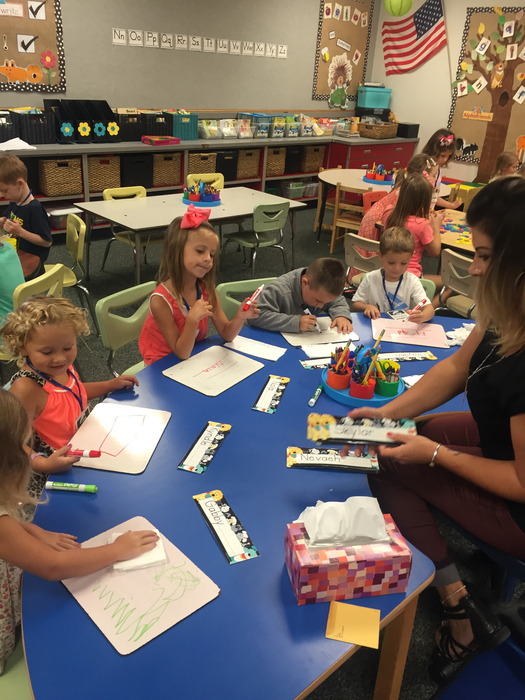 The kindergarten students are settling in! 6th grade orientation @ SMS will be on Aug. 4 from 9-11:30 (lunch provided) involving 6th graders and 8th grade Honor Society members. Freshman Orientation will take place on Tuesday, August 2nd from 10A-1P. This event will include iPad deployment and lunch. 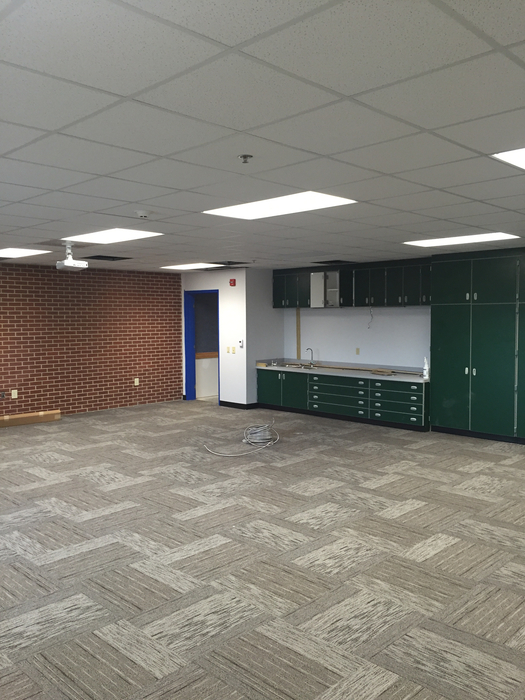 The Selma Elementary Classroom addition will be complete by the first student day! Thank you local contractors. Registration for all #LPSelma schools is July 26th 8:00-3:00 pm and July 27th 12:00-6:00 pm.